A scene that is both aesthetically theatrical and socially mundane…as it relates to a flock of chickens, of course. You can enlarge each photo by clicking on the image. So, what’s with the chickens? This morning. Barn door is open. 9 hens, 1 roo meander in. J goes in barn to work. Dog (Ginkgo) follows. Freaky hen flies in front of dog’s nose. Dog “says” that she cannot take it anymore. J grabs dog, calls for backup. Treats and leash in hand, I entice the chickens back to the coop (excepting one hen.) J walks dog to the porch. We go back to the barn to herd remaining hen back to coop. Almost there and….she spins around; runs, helter skelter, back to the barn. We follow and begin round two. Almost there and she darts back toward the garden. At this point, Sarge (the roo), is fed up with our ineptitude. He trots out of the open gate from the coop with purpose, ’round the hen, and both scoot right back to the coop. What a pro! Cheers ensue! And, in this way, we continue the experiment of raising Icelandic chickens for our homestead flock. We have hatched two rounds of fertile eggs purchased from reputable breeders in Virginia using an incubator. The first flock lives in our mobile coop. They were 6 hens and 2 roosters but, now, 4 hens and 2 roosters because of hawk attacks. These chickens stay put in their poultry fence for the most part. The boys like to call to the morning from their rooftop from time to time. This is Pretty Boy. I, also, had good success incubating hatching eggs from Harvey Ussery this past spring. 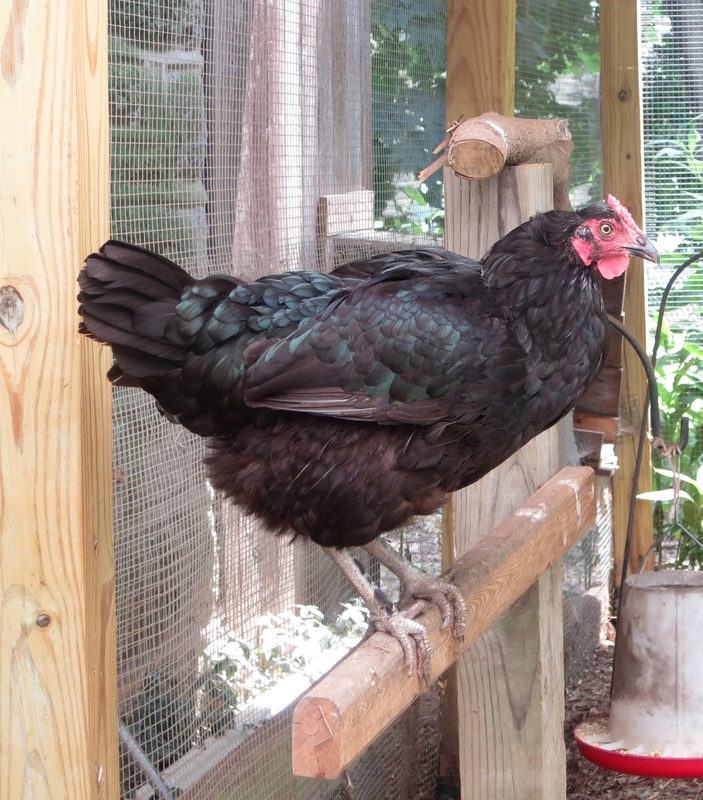 These chickens live in the old non-mobile coop. One rooster (“Sarge”) and 9 hens remain from this hatch. I lost two hens from this flock as well. One hen had severe prolapse with egg laying. She was quite young and it was terminal. The other hen was killed by Ginkgo. So far, they’ve dodged the hawk that lives in the woodlot across the road. Though I intended to keep two roosters in this flock, and did for a while; one of them began to attack me. He was culled. These chickens have decided to be free range. There seems to be no stopping them except to contain them completely (which I will have to do during breeding time.) I could clip their wings but that would be a lot of clipping. These birds can fly! Far and high! No doubt, this serves them well in evading predators. Sarge tends to his flock beautifully. It makes me really happy to see Sarge fussing over, calling to, trying to herd, and tending his ladies. Sometimes, Sarge catches sight of me and he and the girls run in one big flock to reach me, hoping for something tasty. Endearing and hilarious. They, so far, make the choice to go back to the coop before dark. That’s fortunate. I didn’t mean for these hens to be free range because I was afraid that predators, including my dog, would be a problem. And, yes, they are! Ginkgo is responding pretty well to coaching and seems to understand that they are to be off limits. I do have to, carefully, watch for conditions which spark her predator instincts (such as that described in the first paragraph.) She, actually, does quite a good job with barking at and chasing off flying predators. She is alert to the alarm call of the chickens, the screech of a hawk, and the calling of crows which tells Gink that there may be a hawk in the sky. She’ll insist on checking out the situation. We’ll see if we can keep the dog-chicken peace. Crossing my fingers, expecting challenges, and watching like…a hawk? The really good news about these chickens is that there have been no issues with disease as I have had in the past with other chickens. None. So far. I was concerned that not having vaccinated for Marek’s disease was going to be a problem. These birds are healthy, active, curious, entertaining, and beautiful creatures. They are on the small side laying medium eggs at maturity. They are not practical for raising for meat, though, a tasty meal is made from the young culled roosters. There is no way that I can see to raise a sustainable homestead flock without culling out some of the roosters. At least half of the fertile eggs that hatch seem to develop into roosters. Too many. I could make three breeding clans from these chickens but I think that I will purchase one more batch of hatching eggs from a different breeder to allow for as much genetic diversity as I can. I’m hoping that, this time, we will be able to have our broody hens do the work of hatching and raising chicks this spring. Icelandics are reported to make very good, attentive mother hens. I’m starting to plan for a new coop that can accommodate isolation, mating, brooding, and chick raising functions as needed. With this set up and careful breeding, I should be able to keep our own flock going for a long time without bringing in chickens from outside sources. And, so, the experiment continues. Note to self: Keep the barn door closed.